Lady Bug Franchise Systems Corporation offers a unique business concept by providing ECO - FRIENDLY PEST CONTROL. Lady Bug uses natural materials inside and outside, and it is a safe and very effective service. Lady Bug is made up of professionals who deliver a proven system for providing environmentally responsible pest control service both commercially and residentially. Our priorities are safety and customer satisfaction. Using natural materials inside the home, a technique unique to Lady Bug, it is placed inaccessibly to children and pets. It is not only safer than most methods of pest control, it is more effective too. Lady Bug is looking for people to take our concept of environmentally responsible pest control and develop their designated territory. If you are a motivated business professional, looking for an exciting, rewarding Earth Friendly business, this may be the right opportunity you are looking for. 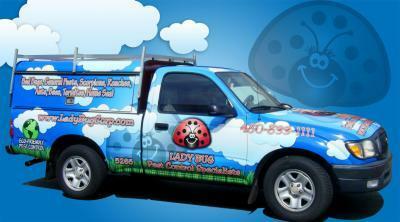 Lady Bug Pest Control Specialists has a proven track record of stability and growth since 1995. Franchising is one of the most effective systems for providing services known today. It combines the ambition and entrepreneurial drive of the small business owner and the experience and expertise of a larger company. Royalties are at 7 % -10% depending on the unit owners licensing level. Lady Bug is a well known name in the Phoenix Area. Our trucks are easily recognizable too. We offer a proven system for success, extensive business experience, and an outstanding reputation within the industry. At Lady Bug we also have a strong desire for you to succeed. Your success means our success. Please call to find out more about a Lady Bug Franchise! 480-833-1111. Franchise Opportunities are available throughout Arizona and the US.